I was hoping to post about each day at the end of the day. This was a great plan until last night. We got home at midnight and frankly I was to tired to post anything. I will try to summarize what happened last night and tell you what we are planning to do today. Yesterday's preview post was accurate. We had a late start because the Altar Boy didn't get up until 10:30-ish. We had lunch at Pirates before heading south on the PCH. What a gorgeous day to drive along the ocean. The skies were incredibly blue and the air was warm. 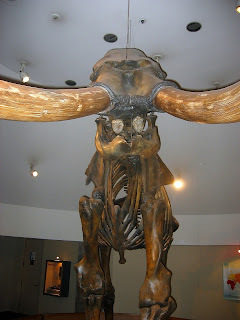 Our first stop was the La Brea Tar Pits and the Page museum. There are usually volunteers in the museum who sit in a fishbowl like room cleaning and cataloging bones. Monday was their day off so the room was empty. The same was true with the active excavation #91. Even with the closed exhibits, it was still interesting. A few pictures here. After the pits we made our way to Olvera Street. We ran into the same problem there - things were either closed or closing. We walked through the shops and did a little side trip to Union Station (The Altar Boy and all male members of his family are obsessed with trains). Again, we enjoyed it enough. By now it was getting close to dinner time so we headed to Canter's and ate some grub. The food was magnificent as usual. No disappointment here. We were going to buy t-shirts (I seem to be collecting T-Shirts - this hobby sort of creeped up on me) but they were out of my size. We will be back I'm sure and I'll eventually get one. After a satisfying meal we went to the beautiful UCLA campus. We were there a little early and the event parking attendants weren't out yet so we drove around trying to find out where to park until they finally arrived. Stupid me took a turn bad and ended up scraping/denting my front bumper - D'OH! We walked around campus a little bit until the show started. The campus is incredibly beautiful. The architecture and landscaping are gorgeous. They opened the doors to Royce Hall at about 7:30. For now I will only say that the show was spectacular. The show was so good it deserves its own post so I will post about it later this week. I will say that the show met and exceeded all our expectations. Now, for Day #4. We will start with lunch at the Cold Spring Tavern before Mission hopping to the Santa Inez and Purisima missions. The day will end with dinner out with the "J" - not sure where yet. I think the Altar Boy had a good time and we managed to keep him safe. Can't wait for the wedding later this summer.